1st August 2000 - Brilliant talk today by Terry Viner. It was enjoyable, informative exciting and inspiring – what more can you ask for from a guest speaker – our group highly recommend him . 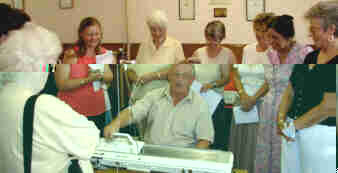 Terry showed us how to correctly set up our ribbers and I think many Priory Knitters will have gone home to check theirs! He gave value for money talking for roughly three hours with only a short coffee break. We now understand more about the workings of the brother ribber having seen the ribber carriage “naked” by the removal of a few screws – but were also warned about the pitfalls too. He went on to show us a variety of rib cast-ons and also how to use the transfer carriage very imaginatively and simply to produce varied plain and purl work incorporating racking, lace and a lot more besides.